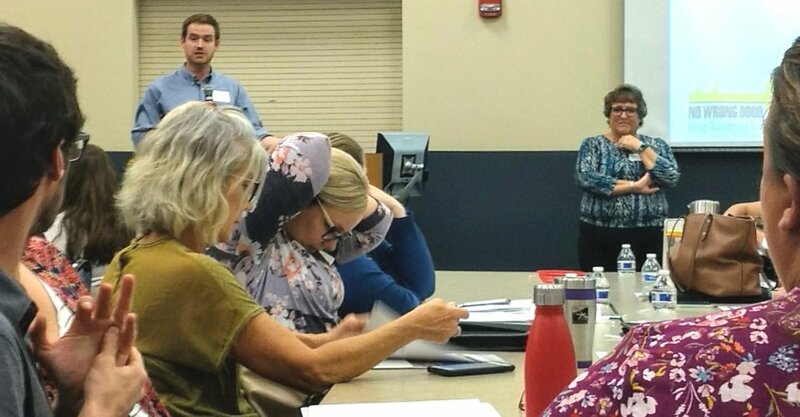 Pictured: (Left) Jason King, Council for Union County Families, and (Right) Shari Marsh, United Way of Union County, facilitate “No Wrong Door” Training on Sept. 26 at 940 London Avenue. The training helps equip front line social service providers with valuable information to direct those in need to appropriate resources. The United Way of Union County along with The Council for Union County Families, Community Services Association, 2-1-1 Helpline and The Housing Coalition of Union County held “No Wrong Door” training last month. The training helps equip front line social service providers with valuable information to direct those in need to appropriate resources. The training program originated with the United Way of Wood County and was an answer to a common problem; those seeking help would reach out to a social service agency, however oftentimes the first agency they would contact was not the correct one to meet their need. The cross training offered by “No Wrong Door” gives the front line workers such as receptionists, intake coordinators and case managers a protocol and questions that can be used to best direct the caller. Shari Marsh, Operations Director for United Way of Union County, helped adopt the Wood County program to fit the needs of Union County. Marsh explained that “No Wrong Door” training ensures that no matter what social service agency they call, the caller will be directed to the appropriate resource. The all-day training was held on Sept. 26 at the Union County Services Building and featured five panels: Housing, Health, Early Childhood, Human Services and Employment Readiness. The 67 participants also heard presentations from Helpline 2-1-1, The Union County Board of Developmental Disabilities, Veterans Services, The Union County Health Department and various health/human services agencies. The comprehensive program provided information on resources in Union County and customer service training so that front line staff have streamlined information about available support and services. Jason King serves as the Coordinator for Council for Union County Families and helped plan the event. He said the training reminds agencies to connect and communicate with one another. For more information about “No Wrong Door” contact Shari Marsh at uwuc.shari@gmail.com.